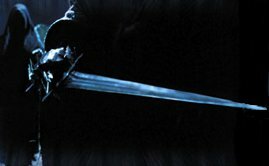 Piercing the heart of the victim, the Morgul-knife was usually wielded by the Lord of the Nazgûl. The blade would not only take the life of the victim, but it would also turn him into a wraith similar to the wielder of the deadly weapon (but of lesser stature and power). If the blade missed the heart, a fragment of the knife would remain inside the victim and slowly work its way inwards. When exposed to sunlight, the bewitched blade would wilt and turn to smoke; therefore, it could only be used at night. The Lord of the Nazgûl used this enchanted blade to stab Frodo atop Weathertop; though Elrond was able to extract the blade fragment, Frodo’s wound never fully healed.